Sacramental bread, sometimes called altar bread, Communion bread, the Lamb or simply the host (Latin: hostia, sacrificial victim), is the bread used in the Christian ritual of the Eucharist (also referred to as the Lord's Supper or Holy Communion, among other names). 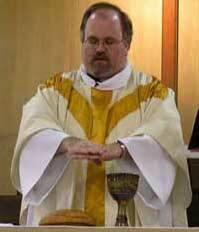 Along with sacramental wine, it is one of two "elements" of the Eucharist. The bread may be either leavened or unleavened (appearing as a wafer), depending on tradition. The word "host" is derived from the Latin hostia, which means "sacrificial victim". The term can be used to describe the bread both before and after consecration, although it is more correct to use it after consecration (prior to consecration, the term "altar bread" is preferred). The sacrifice of Jesus, according to Christian theology, puts an end to the need for animal sacrifice as had been practiced in the Jerusalem Temple and all blood sacrifice once-and-for-all. However the word was retained to describe the bread of Eucharist as a liturgical representation of the Christ's sacrifice. A host is a portion of bread used for Holy Communion in many Christian churches. 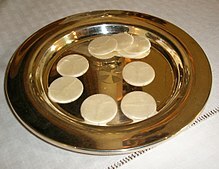 In Western Christianity the host is often a thin, round, unleavened wafer. In the Roman Rite, unleavened bread is used as in the Jewish Passover or Feast of Unleavened Bread. The Code of Canon Law, Canon 924 requires that the hosts be made from wheat flour and water only, and recently made so that there is no danger of spoiling. Hosts are often made by nuns as a means of supporting their religious communities. However, in New Zealand, the St Vincent de Paul Society hires individuals with intellectual disabilities to bake, cut out, and sort the bread, thereby offering paid employment to those who wouldn't have that option otherwise. The General Instruction of the Roman Missal §321 recommends that "the eucharistic bread ... be made in such a way that the priest at Mass with a congregation is able in practice to break it into parts for distribution to at least some of the faithful. ... The action of the fraction ( breaking of bread), which gave its name to the Eucharist in apostolic times, will bring out more clearly the force and importance of the sign of unity of all in the one bread, and of the sign of charity by the fact that the one bread is distributed among the brothers and sisters." ^ "COMMUNION AND THE SACRED WAFER". shmoop.com. Retrieved October 14, 2018.